In Victor Hugo's Les Miserables there is a chapter where he paints a picture of friends in the throws of joyous doings. Much laughter, drinking, and enjoyment of each other's company makes one's spirit giddy. I thought of that chapter while on a winter trip to South Carolina's Kiawah Island. 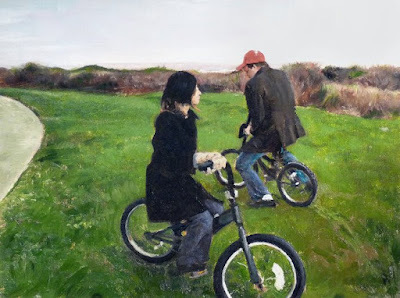 In this painting I depict my friends Harumi and Christian spontaneously riding found kids bikes. Christian is obviously too big for this ride, while Harumi seemed quite comfortable and serene. I hope this painting is seen in person as there is much to the texture that my poor photo taking does not capture. How much is this one goin for by the way?